Not so long ago in the presence of their own poolsite is a kind of indicator of a life of luxury, because not everyone can afford to install it. For the vast majority of people in our country is a miracle in the individual use there only on the TV screen, and such a thing as Filters for pools It was familiar only in discussions grade public facilities. We invite you to stay at these devices in more detail. Today, swimming pools - is no longer a luxury. New technologies have enabled almost anyone to become the owner of at least a small pool. Inflatables, frame, fixed, detachable design - anyone can choose an option based on your own preferences and financial capabilities. 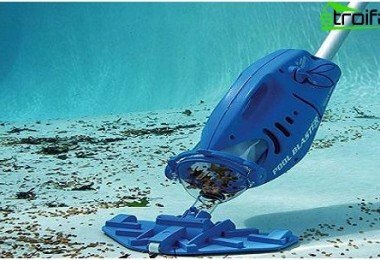 Buying a swimming pool, and have to think about cleaning. In this article we will talk about the different equipment that allows to forget about this issue, and at any time to enjoy a refreshing dip in the clean water of its own pool. For swimming pools of all sizes and their surrounding buildings there is a huge amount of equipment for water treatment. Important: on the proper selection depends on the quality of the purification equipment, water temperature and long-term trouble-free operation of your pool. To ensure the safety of the structure. To ensure a pleasant stay in them. 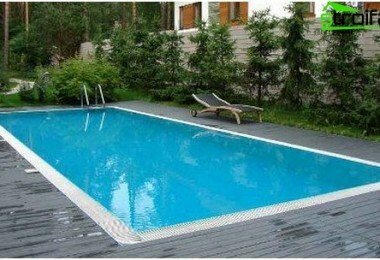 For best results, we recommend the construction of swimming pool and installation of its equipment to conduct simultaneously, ordering all the services in one company. This will not only save a lot of, but also to avoid many mistakes. Filter sand is the poolcheap but less effective than the rest. Sand pool filters placed in large tanks, which is run through the dirty water. All filtered dirt is deposited on the edges of the device. 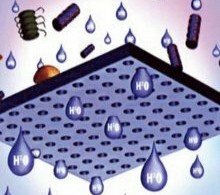 Such a system makes it possible to clean the pool fromParticle sizes above 20 microns. 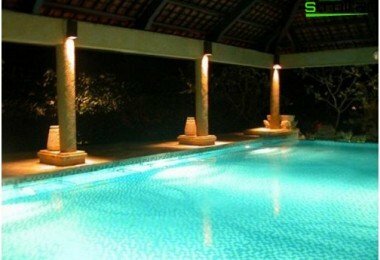 In most cases, it is quite effective for preserving the purity of the pool, but to serve sand filters for swimming pools is quite problematic. At least once a week, it is necessary to clean the tanks with sand using a reverse flow, which leads to a very large flow of water. Therefore, such a system is not recommended for use with limited water resources. Despite this, the sand filter for the pool - the most popular equipment. The diatomaceous earth filters usedspecial cartridges, powder-coated particulate fossil plankton. Compared with sand filters, these devices are much better purified water in the pool, they are able to detain particles over 3.5 microns. such filters require maintenance and cleaning procedures for feedback, but apart from this it is necessary to remove the filter grille and replace diatomaceous mixture. There is a significant drawback: many cities have decided on the definition of this mixture as potentially dangerous to human health, so if you change it will have to think about recycling. Tip: If you want to filter inflatable poolThen the best option would be the sand filter with quartz sand. Finally, the cartridge filters - they containseveral, typically three or four, cylindrically shaped cartridge polyester. This material allows the smallest particle trapping and holding them all the time, while the filter is still clean. Such filters are cheaper diatoms, but a little more expensive than sand. In addition, the cartridge system is very easy to clean, it is sufficient to remove the cartridges and clean them with a strong jet, pre-soaking in cleaning solution. In case of severe deterioration of the cartridge can be found in any shop offering equipment for pools. Each type has its own distinctiveability. Since self-priming pump is usually set higher than the surface level since it can raise the water to a height of three meters. The filter-pump to the pool holding a preliminary purification of water from large dirt particles. 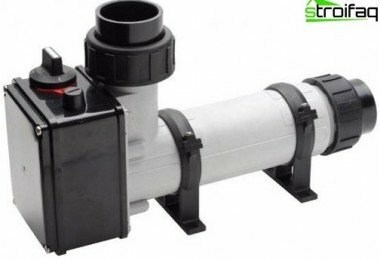 If you buy a filter pump for the pool, be sure to make sure that the performance of the filter element does not exceed the capacity of the pump, otherwise it will lead to a significant deterioration in the quality of treatment, and subsequently to the failure of the entire system. Priming pumps are used in a variety of decorative devices, waterfalls, rides. Even buying a pump for the inflatable pool,should be familiar with its performance. The more volume structure, the more water will flow through the system for each work session. In addition, it is necessary to take into account the conditions of the pool location. If it is placed indoors, the performance of the pump should not be very large, since in this case, the pool will stay longer in the pure state. Another equally important element for filteringwater - pool skimmer. It is designed to clean the surface of dust, hair, sebum and other contaminants. 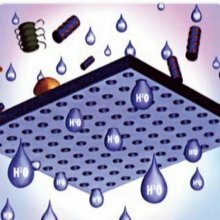 If we ignore this simple device, the pool will form so-called dead zones in which deteriorates faster water and concentrated chemicals that are added during the operation. The easiest skimmer looks like a tankfilter, which through a special opening in the sidewall of the water falls and passes through a cleaning and heating process, returns to the pool. Despite the simplicity of the design, the skimmer pool with their hands is very difficult to do. It is better to buy ready-made equipment in specialized stores, but you can install it on their own. Suspended for skimmer pool todayIt is most prevalent. It does not require integration into the filtration system, and simply hung on the inner side of the pool. Such models can be used for cleaning and inflatable frame pools in which it is not possible to establish integrated skimmers, and also they are indispensable in the case of these devices have not been mounted during the construction of buildings. To hinged skimmer working offline and smoothly, it is necessary to equip the return pipe. If the pool is open, then install hingedskimmer should be on the windward side to the leaves, dirt and dust yourself fall into the sewage treatment system by flow created by wind. In closed basins of the device are placed evenly around the perimeter. One of the latest generation Skinner is able to clean 25 square meters of water surface. On the basis of this calculated value the number of devices required for each pool. Very often in the deepest ground pool skimmers are installed bottom, made of polypropylene alloys. Embedded devices are mounted directly to the wallpool, so their purchase and installation care must be taken in the beginning of construction. Such models are highly efficient and more productive, therefore preferred to very large basins. Therefore, the best choice for owners of small private artificial reservoirs is perfectly functioning mounted skimmer. Properly selected and installedpool equipment will forget about your buck and enjoy the gentle touch of pure, sparkling blue waters, amazing relaxing after a day of work or vigorous invigorating in the morning.